Wandering the post industrial wastelands of America’s Work Shop – that’s me. Spotted the numeral above in LIC recently, adorning the loading dock of some nameless warehousing company housed in the former Waldes Koh-I-Noor site nearby Dutch Kills. The Real Estate Industrial Complex recently discovered the former Degnon Terminal, it seems, and the Waldes buildings are currently being marketed as “The Zipper Building” by the powers that be and to opportunists who have connected themselves to LIC as some sort of stepping stone from Wall Street. 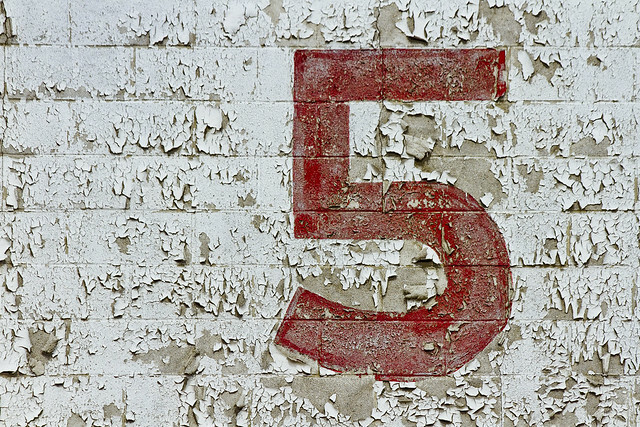 As a note, five is the only prime number that ends with the number five. It’s also the only number which seems to be entirely European in origin, having little verisimilitude to Arabic or Indian glyphs that represent the number. There’s five senses, five books in the Torah, five wounds of Jesus, five pillars of Islam, and in western music – a perfect fifth is considered to be the most consonant of all the harmonies. In geometry, there’s the Pentagram, and of course – you’re reading the pentacle. 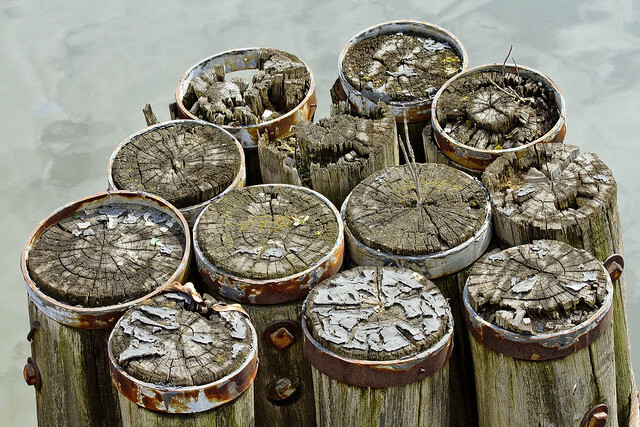 Speaking of Dutch Kills, when you see a structure of creosoted logs held together with iron, as you do nearby the Hunters Point Avenue Bridge – the official term for this sort of thing is a “dolphin.” It’s meant to vouchsafe the bridge against an accidental collision by maritime traffic, but since there’s little to no maritime traffic on Dutch Kills – a tributary of the legendary Newtown Creek – these days, it’s just a thing to take pictures of. There’s twelve former trees, infused with creosote oil, in that shot above. Twelve is thought to be a Germanic/Old English term describing the smallest composite number which has exactly six divisors. It’s the largest number that has a single syllable name in the English language. A cube has twelve edges, the human body has twelve cranial nerves. The Western zodiac has twelve signs, as does the Chinese variant, and the 12th moon of Jupiter is called Lysithea. From the Newtown Creek Waste Water Treatment Plant Nature Walk in Greenpoint, should you have a medium long zoom lens on your camera, you can observe the Sims Metal Management Company at work – processing all sorts of metallic things. In the case of the shot above, it’s derelict cars in the process of being recycled. 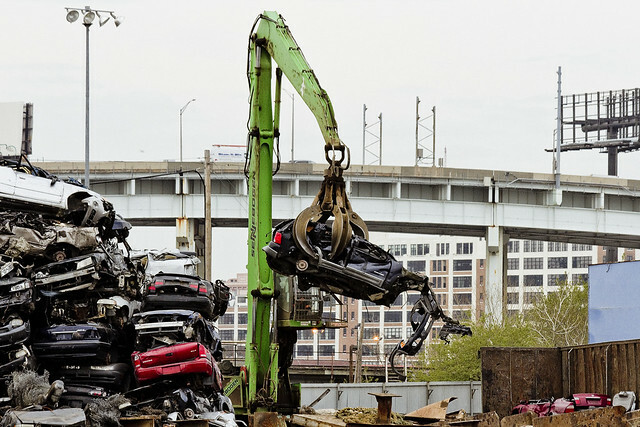 After collection at Sims on Newtown Creek, these automobile carcasses will be barged out to New Jersey where they will be fed into a shredder that will reduce them down to metallic bits and a cloud of dust. As I count it, there’s eighteen automobiles in the shot above. The number eighteen translates from the Hebrew word for it (Chai) as “Life.” There’s 18 chapters in the Bhagavad Gita, which is part of the 18 book Mahabharata. Chinese tradition declares the number eighteen as a lucky one. Eighteen in binary code is “10010” which is a seven block long zip code in Manhattan – from 20th to 27th, and from Sixth avenue to the East River. 51218, you ask? According to the National Institue of Helath, that’s the numerical designation of a gene we inherited from our single cell ancestors. What all of this means, I can’t say, but it’s kind of freaking me out. Of more interest and not mentioned above (for shame sirrah that you should neglect this in your numerological musings) is the Golden Ratio and Fibonacci numbers based spiral derived from it. It is argued by some that the true name of God is in fact a number, not a name pronounced by human phonemes. As we all issue from two parents and both parents likewise had two parents with each preceding generation. and therefore multiplied by two- two parents, four grandparents, eight great-grandparents, etc. So, if one were to continue this multiplication by two, one would find themselves after thirty one (31) generations back having 2,147,483,648 direct ancestors. If we were to use generous 25 years per generation, we would be only going back 775 years and thus greatly exceeding the human population existing at that time estimated to be 400 to 415 million souls. However I must add the disclaimer that I have no formal education regarding, or have read on the subject of demographics. So I may have made an absurdly simple error in the method of calculation and perhaps our humble narrator or a more knowledgeable reader on the subject may set me straight. But I really don’t see how. After all, everybody has two parents right? Don’t forget the 12 apostles.